Eating was never one of my biggest targets when on the road, but once my travel preoccupations increased, so did my interest in testing local foods and flavours. When in London, I always try to get the latest good kosher restaurants and trends and where else can I find inspiration but in Golders Green? And I never got disappointments, as the local food scenery is dynamic and diverse, trying to answer the needs of the very sophisticated customers. The home cooking in this part of London is extremely diverse and sophisticated and if you want to impress and take the people out of their homes for dinner you should be very good and to offer the best quality menu at a good price. Since my last adventures in the world of Golders Green food, some of the restaurants reviewed closed down - Yum Yum for instance - but new one appeared, inviting the food writer I wish to be to test them at least once. Many offer the possibility of take away - sometimes in exchange of a little extra fee. I am very careful with the Chinese food, but after a long diet, I decided that Met Su Yan - a game of words and sounds, as in Hebrew metsuyan means 'excellent' - could be a good choice for a special evening. Especially on Sundays it can be very crowded so a reservation is highly recommended. The place is cute, clean, but a bit crowded, if more than half of the tables are taken. The prices are 3-4-star, but the portions are big. If you decide a 3- or 4-course menu, you will get a good price and a lot of food of your choice. The service is good, with the waitresses patient enough to explain to the non-educated customer all the details of the mysterious names of some of the plates. The cuisine is not necessarily Chinese, but also Vietnamese - I strongly recommend the coconut rolls - or Japanese - lovely sushi choices for the curious and passionate or Thai - not to miss the Pad Thai. I was not extremely impressed by the sauces - especially for the duck with plum sauce - but instantly went in love with the mango duck. Mouthwatering only when I think about it. As for the sweets, highly recommended the ginger icecream. The next time I'm back, there is where I want to start my food trip. Late on a Saturday evening, Isola Bella is not open and if not going there for one of the delicious cakes - I went there the last Thursday and tasted an Irish cream meringue that finished too fast - why not continuing with more meat meals? I can't refuse such an offer and tried Sami's. Two days after we were back. I did not like the red decorations and the lights, but otherwise it is clean and with a friendly service. They have a lot of Iraqi specialities - the zaatar bread is unforgettable - and well done skewers. The chicken Tikka is unexpectedly delicious - I don't trust always the Indian specialities prepared in a not typical Indian restaurant -, but the simple Chicken skewers are light and tasty too. I liked the roasted potatoes and the coleslaw, but I am sure there are more hidden gems in the menu. The choice of desserts isn't that great, but a vanilla or choco icecream (parve) can end up the meal in a very smooth way. Curious to check if everything is fine, I stopped by at Dolce Vita (again) where I was overwhelmed by flavours and taste of the risotto salmon. As usual, the choices of fish and salads is good and the taste accordingly. The green beans salad and the olives at the beginning were good enough to appease my big hunger after hours of travel. 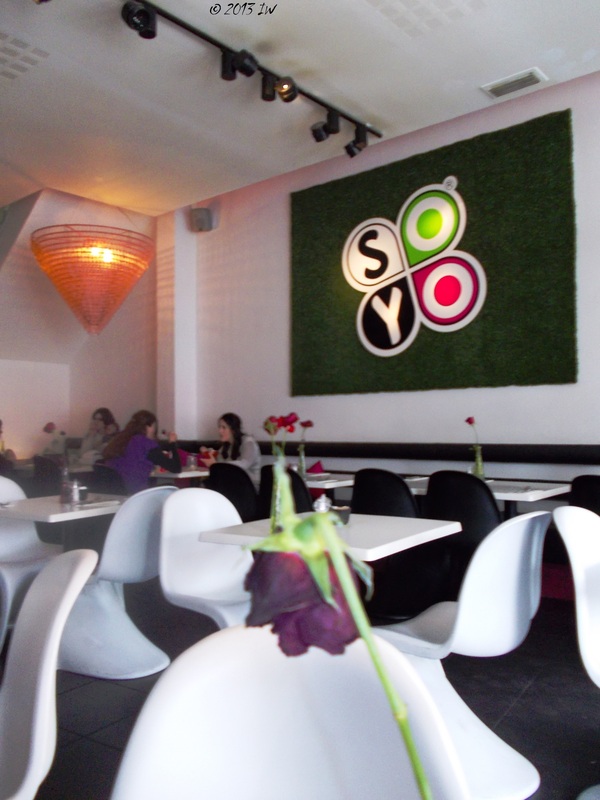 The last on the list was SoYo, where I wanted to have only a simple frozen yoghurt. It is usually busy during the morning - they serve a 7.95 £ breakfast menu that looks quite rich. But there are also soups and salads and pasta, and some smoothies too. Upstairs it is a playground with heavy air conditioning during the summer. It is medium priced and not very clean. My biggest disappointment was the service: unfriendly, unhappy and delayed. I will return only if all the restaurants, pubs and fast foods around are closed.